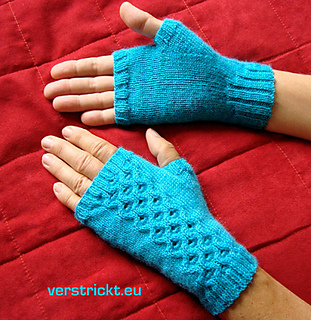 Small round holes embedded in a cable pattern – like volcano lakes (“Maare” called in German) in a hilly landscape – decorate these fingerless mitts. 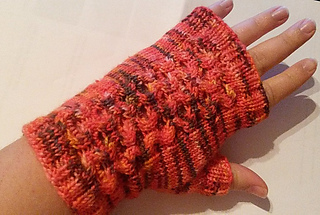 A thumb gusset and an elongated rib cuff on the palm side, which is knitted in stockinette stitch, provide a good comfortable fit. A handy accessory for autumn and a great gift idea. The back of both hands and the palm sides are shown in charts, with added explanations. There’s also a photo tutorial which explains the increases and how to create the holes in the cable pattern. You can use any other (sock)yarn with a similar yardage.